There are now competing federal infrastructure plans in DC or at least the outlines that can be used for actual legislation. The plans are significantly different and speak to the divergence in the philosophy of government of the two major parties. While it remains to be seen as to how the process will move forward on the proposals, discussion points to the growing concern that the country is not paying close enough attention to the issue of infrastructure. 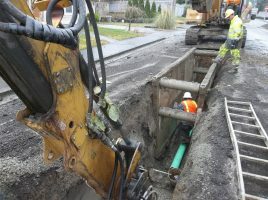 For those of us in state and local government that depend on federal resources to help offset the monumental costs of solutions to this type of problem, the question is whether there is significant momentum to carry through to a solution. A look at the literature on agenda setting can provide some clues. In fact, policy scholar John Kingdon in his 1984 work Agendas, Alternatives and Public Policies posits that an issue will rise to the top based on the confluence of the problem, policy and politics streams. The framework is very useful as we examine where we are with respect to infrastructure and the prospects for near term action to increase federal investment in this critical area. Many theories of the policy process begin with a problem recognition stage and Kingdon is no exception. Government rarely acts in the absence of a widely recognized problem but that isn’t entirely the case. Conversely, the acceptance of a phenomena as a problem does not mean it is significant enough to get on the policy agenda. Rather the problem lends itself to indicators and some type of focusing events or symbol. In the area of infrastructure there are myriad indicators. Annual reports on the national situation from the American Society of Civil Engineers garners attention with the recent “D+.” This is a decline from a grade of “C” in 1988, and, with it, an increasing cost to bring the situation back to an excellent grade of $4.59 trillion. This amount is far in excess of what will be expended by state and local governments, quasi-governmental agencies and the federal government under current plans (about $2.5 trillion). The second part of the theory involves the output from policy communities. The universe of agency personnel, congressional staffers, budget officers, academics and interest group advocates all form alliances or offer competing ideas for solutions in their areas of expertise. The regional impacts of creative solutions are good examples of ideas that can be scaled up nationally given proper resources. San Francisco is tying infrastructure improvement to workforce development melding multiple interests together and this project is being promoted by scholars at the Brookings Institute. Water, transit, ports, airports, roads and bridges all have advocates and in the 21st century are joined by those advocating for a build out of high-speed internet infrastructure as well. The political stream is defined in the narrow sense of competition between parties and interests and governed by an overall national mood. Kingdon makes the point that politicians can sense the national mood from interactions with constituents, newspaper coverage (we benefit from social media that was not present when he was doing the research), interest groups and voices from social movements and political leadership. What is important is the shift in climate that makes some problems and solutions more viable than at another political moment. There are limitations, frequently self-imposed, on the viability of certain kinds of solutions that are available in the public realm. While there is a strong stream of thought on infrastructure in both parties, the self-imposed budget constraint can push against progress. This is why the Democratic plan, which uses more federal money than the Trump Administration outline, calls for rolling back elements of the recent tax bill. The final component of the three streams model is whether there is a convergence because of an open “policy window.” We saw this regarding bridge safety after the tragic Ohio River Bridge collapse in 1967 which led to Congressional action on bridge inspections. While flood water from storms, poisoned water in Flint, prolonged blackouts in Puerto Rico and declining road conditions focus the public’s attention on infrastructure spending, it requires a political focus to advance discussions and metaphorically open the window. The window is partly open by a campaign commitment from the Trump Administration and partly due to Democratic Congressional leaderships’ recognition of the opportunity to channel federal spending into an area that will create jobs and improve the quality of life. Infrastructure is a broad area which includes everything from water through internet. Frequently, highly desirable projects have a cost that exceeds local resources, such as a new railway tunnel under the Hudson River. Kingdon warns us that such a moment could pass, regardless of the policy merits. There are so many competing ideas which require the same resources or the same attention from lawmakers such as that being paid (and rightly so) to the #Enough movement. How many people are willing to rally in the streets for more spending on water, sewer, bridges and dams? For advocates, now is the time to seize the moment.